Ballyarr Wood has been designated as a candidate Special Area of Conservation under the EU Habitats Directive because it is one of the best and largest examples of a semi-natural deciduous woodland in the north-west of the country, and forms an important link in Irelands network of woodland reserves. Old sessile oak woods with holly and hazel is a habitat listed in Annex 1 of the EU Habitats Directive. Ballyarr Wood is predominantly old oak woodland. A number of other habitats including wet woodland, scrub wet heath and wet grassland also occur. 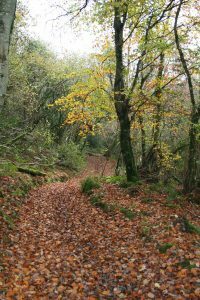 The oak woodland has a well developed structure, with a high canopy of well grown oaks, a good understory of holly and hazel and rich ground flora. Natural regeneration is occurring. The other habitats, particularly the open areas of heath and wet grassland, enhance the diversity, value and character of the woodland. Access is provided at Ballyarr by a circular path which takes you through the oldest part of the woodland and shows the variety of habitats. We are managing the woodland using traditional techniques, it is grazed during the winter months by small horses which eat the grasses, sedges and rushes and open up the ground to facilitate regeneration of the oak, hazel and holly. We are also coppicing the hazel in rotation to allow healthy regeneration. Non native trees are also being removed to allow more space for native trees such as Oak. Ballyarr is a fantastic place to explore some of Irelands better known mammals. Evidence of badgers with huge setts and fox holes are to be found, deer visit the woodland occasionally and stoats make their homes in the old stone walls throughout the wood. The birdlife in Ballyarr is very diverse from the larger nesting Buzzards and Ravens to the noisy Jay and not mention the wonderful chorus of the smaller woodland birds.